The "IN" Show: the Place you go to be in the Know. A special note for Leigh: Thank you! What can happen when there's no Plan B! San Gabriel - Leigh Rubin, the Nationally Syndicated "Rubes ®" Cartoonist, is a man overflowing with humor, creativity, and the desire to share with others. For those who found themselves lucky enough to attend his presentation at the San Gabriel Library, he delivered his, "A Twisted Mind is a Terrible Thing to Waste." Leigh, with his good-natured humor, kept everyone wanting more as he delivered a humorous introspective exhibition of himself, his creative process and his long-lasting career. 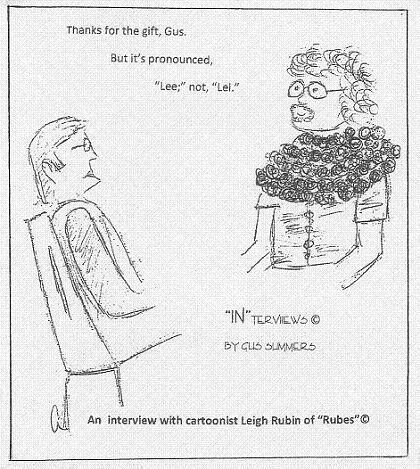 For those who are unfamiliar with Leigh Rubin, he began his cartooning career in 1978, by establishing his own greeting card company, Rubes Publications. Although he found it difficult to break into the mainstream cartoon syndicate, undaunted, Leigh began self-syndication to promote his work. The Antelope Valley Press was one of the first to begin printing his single panel comic. "Rubes ®" is now distributed by Creators Syndicate to more than 400 newspapers worldwide. To put it in Leigh's words, "Major, middle, minor newspapers - far and wide - I love them all." And so do we; because, they keep delivering to us his witty, twisted humor! To listen to Leigh's lecture is to hear a man who is passionate and full of determination. He is passionate about drawing: He started at a very young age and never looked back. He drew throughout his childhood, into his teen years and even took art classes in college. He is an admirer of such Cartoon Giants as Chuck Jones and Charles Schultz. And that passion for drawing continues today, as is evidenced by his numerous books of "Rubes ®" Collections. His determination is amazing. When starting out, he not only self-syndicated, but also printed his own work, was his own distributor, and represented his work at trade shows. As he says, "There was NO Plan B!" For all of us who faithfully read his comics, we're glad there wasn't! Presently, in order to celebrate his 25th Anniversary of "Rubes ®", Leigh has just released "The Wild and Twisted World of Rubes", published by Andrews McMeel Publishing. This author can assure you it is a MUST read. You can learn more about Leigh by visiting his site: www.rubescartoons.com. To catch his interview online, you can see it at The "IN" Show's "IN"terviews. To Mr. Rubin, we look forward to another 25 years of your wild, witty, and twisted humor. May your "open ended adventure" continue on!